Rodney Cox was born to Henry and Suellen Cox in Burlington, North Carolina in 1975. On May 12th, 1991 he was invited to Friendship Baptist Church where he accepted Jesus Christ as his personal Lord and Saviour. In January of 1993 he accepted the call to preach and served the Lord under his Pastor, Chris Haizlip. He met his loving wife Mrs. Christina in Greenville, South Carolina where he attended Tabernacle Baptist College. He married Christina and served under Pastor Tommy Cook at Friendship Baptist Church. 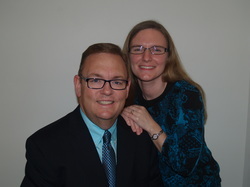 The Lord blessed Pastor Cox with four children before he began to pastor New Grace Baptist Church in Salem, Virginia. After serving in Virginia for five years, God moved Pastor Cox and his family to their present location in Southport, North Carolina. Please assist us in daily prayer for our Pastor as he works for the Lord and leads Sonrise under God's guidance.